But I don’t want to contribute to fear-mongering, so let me be real: we don’t need to worry too much about the arsenic. Before I came to that conclusion, I did some reading about what arsenic was doing in my rice. I learned that when the U.S. Food and Drug Administration increased its testing of rice a few years ago, it found levels of arsenic at about 2.6 to 7.2 micrograms per serving. To put that in perspective, this value is well above the allowed limit for arsenic in water — at least in concentration. If one serving of water is considered, a cup of water would need to have less than 2.5 micrograms of arsenic. Of course we need more servings of water per day (let’s say eight cups or two liters, max 20 micrograms), and most people don’t have five servings of rice per day (13 – 36 micrograms), so it’s all relative. FDA also assures that these levels are not a cause for worry in the U.S., headlines be damned. Some of the world’s poor, however, do live on nothing but rice (several servings per day if they are lucky); and if they are unlucky, they live in areas with naturally high levels of arsenic in the water.compounding the risks. Clearly it would be good to find a permanent solution to lowering the levels of arsenic in such a basic staple. The stuff in high concentrations is a world renowned poison, after all. How does it get into the rice in the first place? The U.S. Environmental Protection Agency tells us that sources of arsenic include erosion of natural deposits; runoff from orchards as well as runoff from glass and electronic production wastes. As FDA puts it, “arsenic is a naturally occurring contaminant, and because it’s in soil and water, it’s going to get into food”. Arsenic happens to get absorbed into rice particularly well, because its form on rice-fields (arsenate) resembles the form in which silicon is taken up by the rice plants. Silicon is used to build the sturdiness of its stems. Getting arsenic in its place is a problem for the plant too. Tough luck. Researchers based in Korea and Japan have shown that a rice transporter protein called OsABCC1 prevents arsenic from damaging plant tissues by sequestering the element in vacuoles. Because of this, potentially harmful arsenic remains in these cellular waste containers rather than building up in rice grains. That is great news! Science could help us truly not worry about arsenic in our rice. In the meantime, the message seems to be: eat a varied diet and you will be fine. So I will get on instead with the really bad problems with rice. What problems? Like how the climate toll from rice cultivation is on par with cow farts, the leading source of methane gas release in the world. Take a look at the global methane emissions chart: contributions from rice cultivation are big enough to feature in the top four. 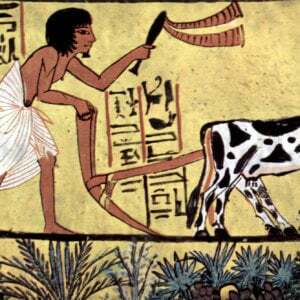 The sum of methane leaks from all ruminant farm animals’ digestive systems’ (AKA Enteric Fermentation) is still by far the biggest anthropogenic source, since a cow emits a whooping 250 – 500 liters of methane per day. Emissions from oil and gas are a large second. But on the nearly shared 3rd and 4th places are all the world’s landfills and the cultivation of one single crop: rice. The IPCC Fifth Assessment Report determined that methane in the Earth’s atmosphere is an important greenhouse gas with a global warming potential of 34 compared to CO2 over a 100-year period (although accepted figures probably represent an underestimate). The potential of this discovery is mind-boggling. Comparing that to the yearly climate mitigation effect that GMO crops have at present, equivalent to closing down seven to eight coal-fired power plants, it’s huge. This rice alone could do that ten times over, and twice again. So how does the rice do it? 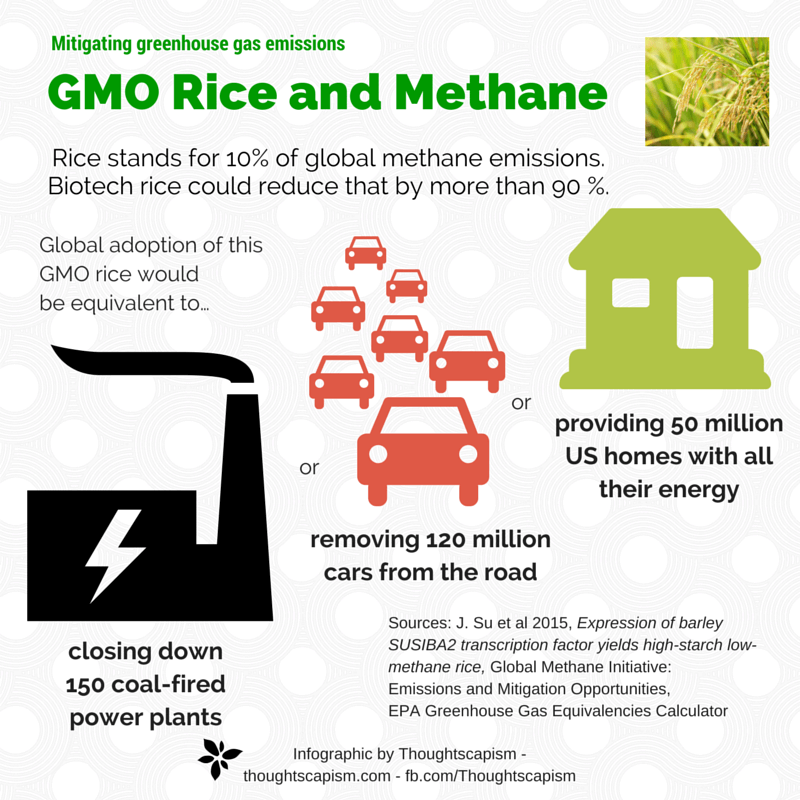 And why is so much methane emitted from rice cultivation in the first place? 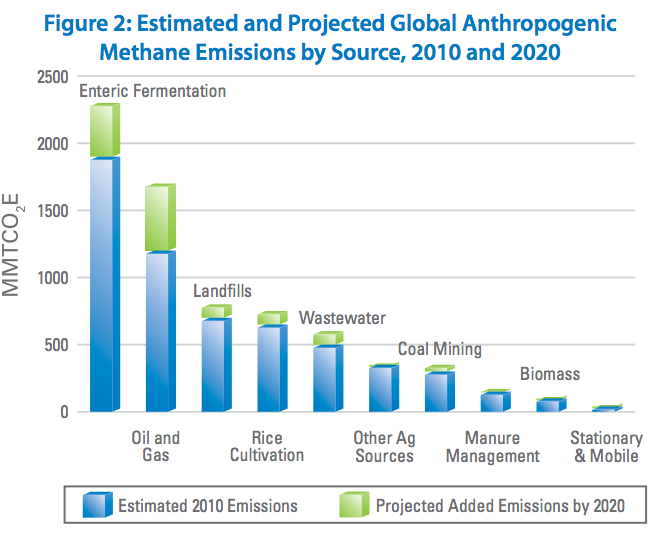 When we consider many other methane sources, like ruminant’s stomachs, or landfills (or compost for the matter; read more by scientist Steve Savage on the shocking carbon footprint of compost), the key are anaerobic methane producing bacteria, or methanogens. Methane is a natural byproduct of the metabolism of bacteria at work in digesting plant material, called methanogenesis. These bacteria are why cows and other ruminants can live on such tough plant materials (grass stems and leaves) which are near useless to most other animals. These bacteria work at conditions where there is no oxygen, in fact, oxygen is largely fatal to them. This brings us to rice, or more specifically, flooded rice fields, or paddy fields. In the protective anaerobic environment – the drowned soils of these fields – methanogens are hard at work munching roots and other plant material, bubbling away with methane. Microbial production in anoxic wetland rice soils is a major source of atmospheric CH4, the most important non-CO2 greenhouse gas. The authors saw that during the wet season, the formation of spikelets — the flowering, grain-forming parts of the rice plants — was reduced, and the methane emissions were high. They got higher still, when they artificially blocked the plant’s ability to form spikelets. Why? 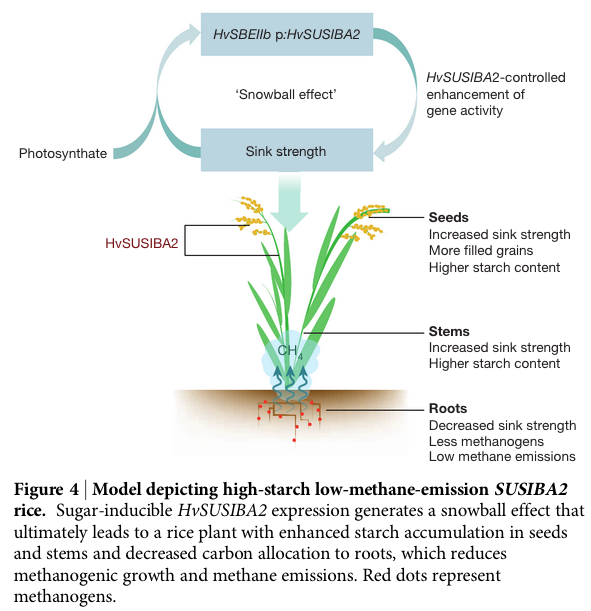 When the plant could not store its starches in the developing rice grain, they went increasingly to the lower parts of the plant, the roots, and more starches became available for the bottom-dwelling methanogens. It seems that wetter years are bad in particular for spikelet formation, and simultaneously, with no risk of drying out and being exposed to oxygen, that’s when the methanogens feast and thrive (and the warmer the better). Nipp is the control, SUSIBA2-77 is the modified rice. The biomass profile is visibly skewed upwards. The observed relationship between reduced grain filling and CH4 emission provides opportunities to mitigate CH4 emissions by optimizing rice productivity. Fast forward to today. 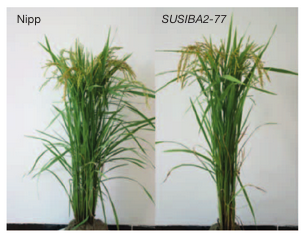 The big news: the SUSIBA2-rice is here, as presented in Nature. The new engineered rice promotes more biomass accumulation above ground, away from reach for the methane producing bacteria. 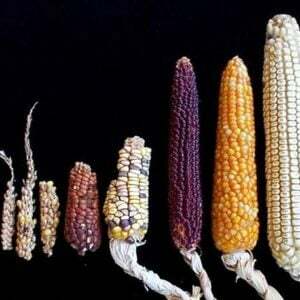 This results in 90 to 99.7 percent lower methane emissions, while also increasing yields — up to 1.5 times as much seeds per plant in weight and 10 percent higher starch content in the grains. If you look at their model below, they describe greater “sink strenght” in the seeds and stems. “Sink” describes a plant part that is a sugar sink to differentiate from the sugar sources – photosynthesis locations are the sources, storage compartments are sinks. Optimistic news pieces are popping up left and right. So what are we waiting for? Let’s amp up large scale testing, put some public financing into this and make it an international project of climate mitigation. 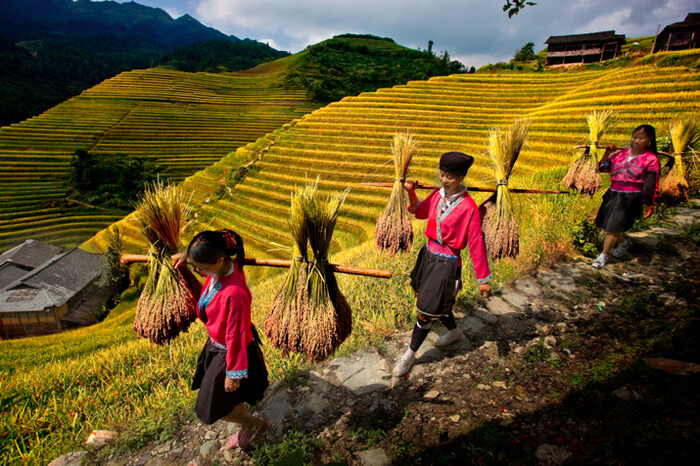 In a few years, or a decade, we could be growing vast paddies of climate combating rice. Well, not so fast. No matter how good the prospects, sometimes simply having a better solution is not good enough. It can be hard for people to follow the world of science, and when faced with a novelty, they may go instead with their gut reaction. Why is rice contributing to so many deaths? Maybe you caught that I never explained that third problem I listed — the part about “inadvertently contributing to millions of deaths worldwide” part. That problem illuminates this point very well and reminds us that changing the world is not just up to science. It’s also about impressions and politics. Three billion people depend upon rice as their main source of food of which 10 percent are at risk for vitamin A deficiency. 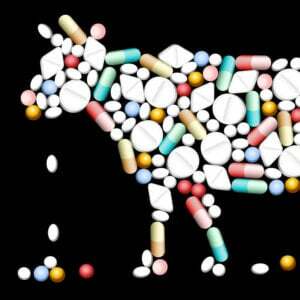 Vitamin A deficiency (VAD) weakens the immune system, increasing the risk of infections such as measles and malaria. Severe deficiencies lead to corneal ulcers or blindness. According to the World Health Organization, VAD is the cause of 250,000 to 500,000 children going blind each year. Half of these children die within a year. Additionally in Asia and Africa, almost 600,000 vitamin A-deficient women die from childbirth-related causes. This is no small matter. What makes it heart-wrenching is that we have a solution. Independent scientists in a Swiss University created a rice with beta-carotene — the vitamin A precursor well known from carrot. 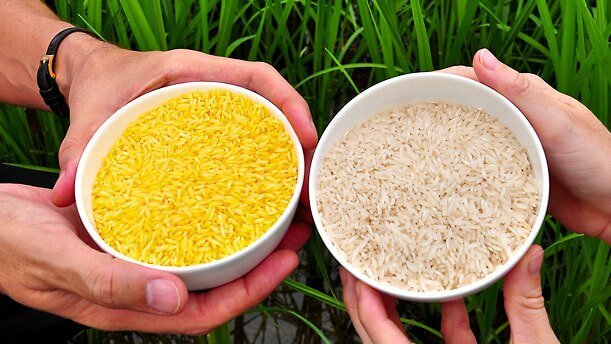 The rice has a yellow colour, and is called Golden Rice. It’s a non-profit project, and for more than 10 years, the scientists have wanted to give it to the farmers of the developing world to help alleviate disease and suffering (see Golden Rice opposition cost $2b and 1.4 m ‘life years’ over 10 years in India alone). But activists have sabotaged them out of not much else than fear and refusal to listen to scientific evidence. Patrick Moore, one of the founders of Greenpeace turned global food activist, characterizes Greenpeace’s vehement campaign against Golden Rice as a “crime against humanity.” (See also Sorry Greenpeace, Golden Rice is a Win for Nutrition and Health and GM plants present low risk — say scientists). 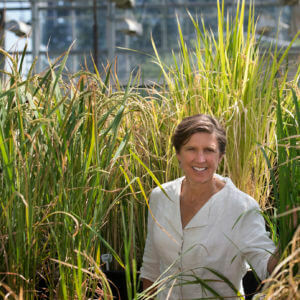 A safe more nutritious variety of rice could help prevent millions from death and disability. Another modification of rice could protect them from arsenic accumulation. A third revolutionary discovery could help the globe by combating climate change. We can make the world better with biotechnology. If people will let that happen. Iida Ruishalme is a writer and a science communicator who holds a M.Sc. in Biology from Sweden. She is a contributor to both Genetic Literacy Project and Skepti-Forum.org. She blogs over at Thoughtscapism. Follow her on twitter: @Thoughtscapism or on her Facebook page.